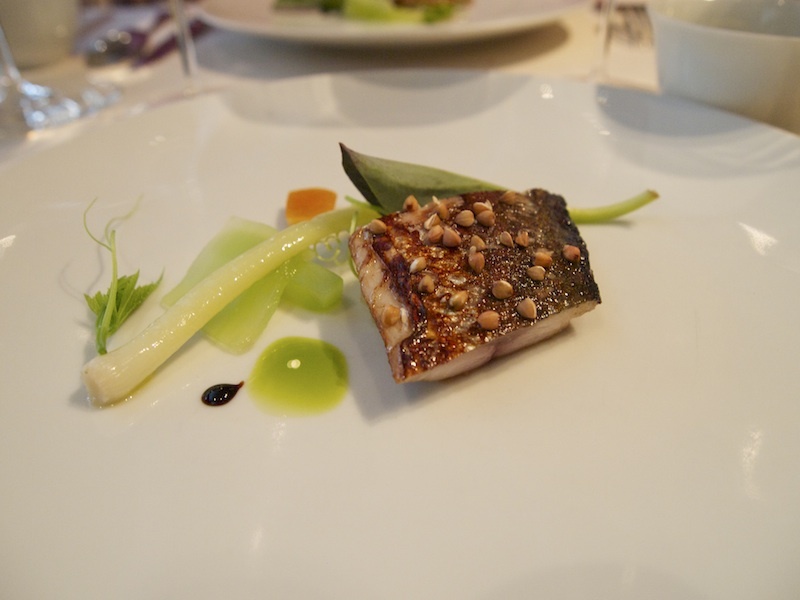 Sometimes when you look at Twitter, you would think Paris only has two three-star restaurants: Alain Passard's l'Arpège and Pascal Barbot's Astrance. 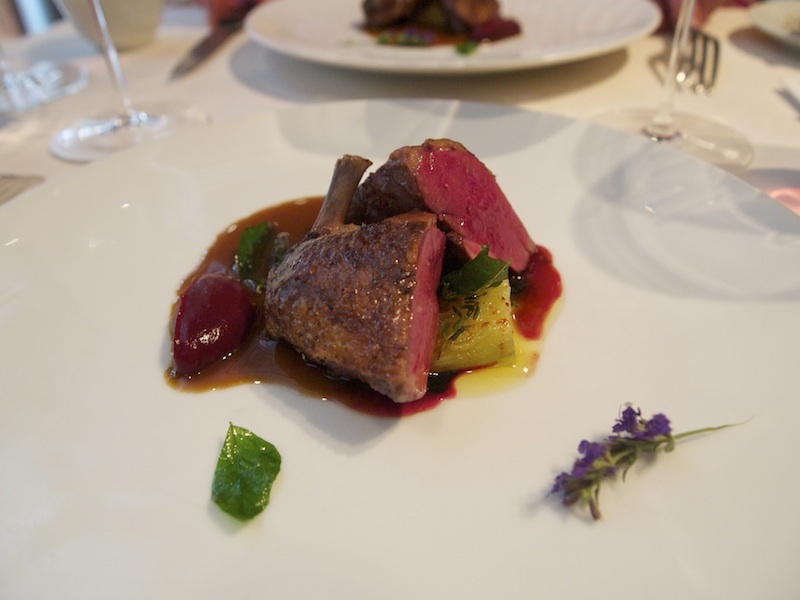 Paris has 10 three-star restaurants in total, but l'Arpège and Astrance seem to be at the top of many wish lists; Astrance surely was on mine. In my experience l'Arpège is not that difficult to get into, since the restaurant is open for lunch and dinner 5 days a week (all year around, even in August). Astrance is a different story, or so they say. Pascal Barbot's 25-seat restaurant is only open 4 days a week (Tuesday till Friday) and they have a two-month reservation policy. When you consider that effectively only 200 people a week can have a meal at Astrance, a surprising number of international gastronauts do manage to get a reservation. Right, so how did I get in? Sheer luck and a bit of perseverance. I was in Paris in the last week of August. Booking a restaurant in August in Paris can be quite a challenge, since most restaurants are closed for their summer holiday. Astrance was on holiday too, the restaurant (and their reservation lines) would re-open on 27 August at 5pm. I had decided that I would try to do Astrance 'on the hoof', so to speak. So, 27 August, 5pm, two mobiles, one landline, 50 minutes of frantic dialing activity and then I got through! I managed to secure a lunch reservation for the 29th. 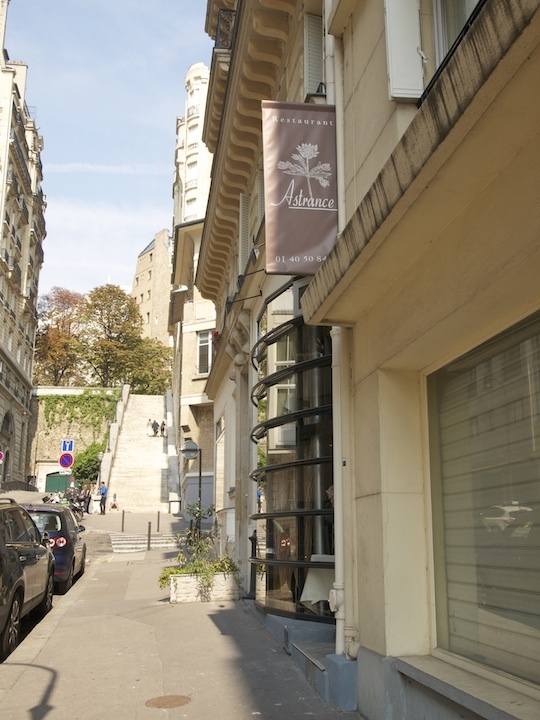 Astrance (named after a wildflower indigenous to Barbot's native Auvergne) is the restaurant co-owned by chef Pascal Barbot and restaurant manager Christophe Rohat. Barbot started his career in 1991 at Buron de Chaudefor in Murol (Auvergne) and later that year he went to work at Les Saveurs in London, a restaurant that would later be owned by by Marco Pierre White. 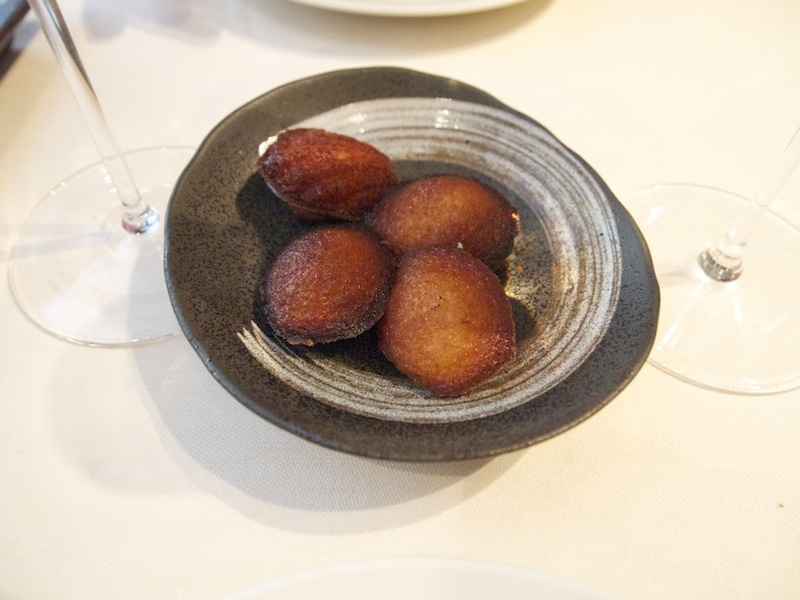 In 1993, after his military service in the French Army, he started as a commis at l'Arpège in Paris. 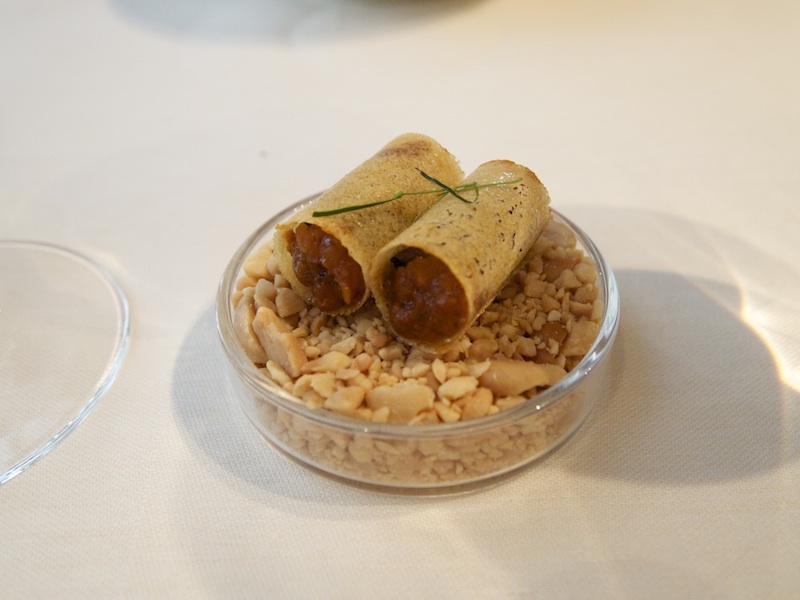 When he left l'Arpege in 1998 he had worked his way up to being Alain Passard's 'responsable de cuisine' (head chef) and it's also there that he met Christophe Rohat. Barbot then went to Sydney for a while, to run Ampersand restaurant. Back in Paris, he became head chef at the famous Lapérouse restaurant in the 6th arrondissement, but only briefly, because at the end of 2000, Barbot and Rohat opened their own restaurant: Astrance in 16th arrondissement. The restaurant was an instant hit and Michelin awarded the restaurant a Michelin star just a couple of months later in their 2001 guide. A second star followed in 2005 and a third in 2007; Pascal Barbot was 34 at the time. Astrance offers three surprise multiple-course tasting menus: there's a seasonal tasting menu for €120, menu Astrance for €210 and a lunch menu for €70. I had lunch at Astrance with my husband on Thursday 29 August 2013 and we both ordered the Astrance menu. 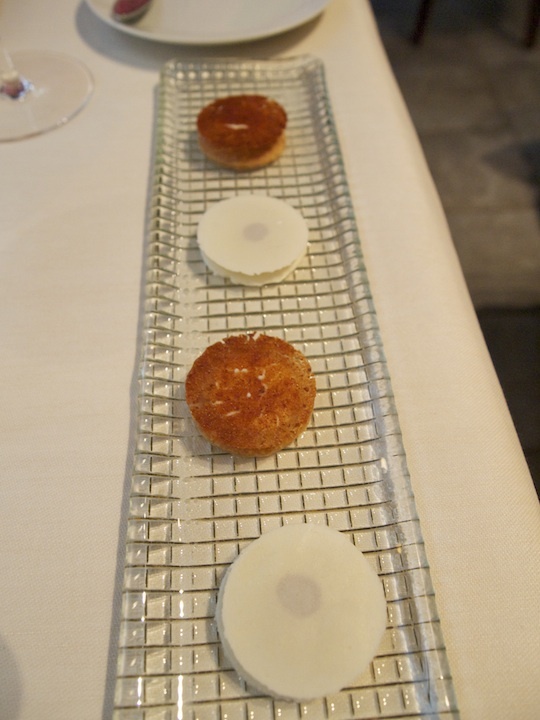 First to be served were two beautifully made 'sandwiches', crispy white almond with a green apple filling and brittle brioche sablé with a foie gras crème filling. First course and possibly the most photographed three-star dish in the world, Pascal Barbot's 'Tarte au foie gras, champignons et agrumes'. A crunchy and lightly caramelised pastry base, topped with layers of thinly sliced, juicy white button mushrooms, sprinkled with citrus zest such as orange and lime, thin layers of crisp green apple, a fat layer of creamy foie gras and a top layer of mushrooms sprinkled with some dried porcini powder. Lovely light woody flavours from the mushrooms, warm unctuous flavours from the foie gras, sharp freshness from the apple and the pastry delivered a nice touch of warmth. With the tarte came an intense bitter-sweet and zingy lemon confit puree and a concentrated hazelnut oil. 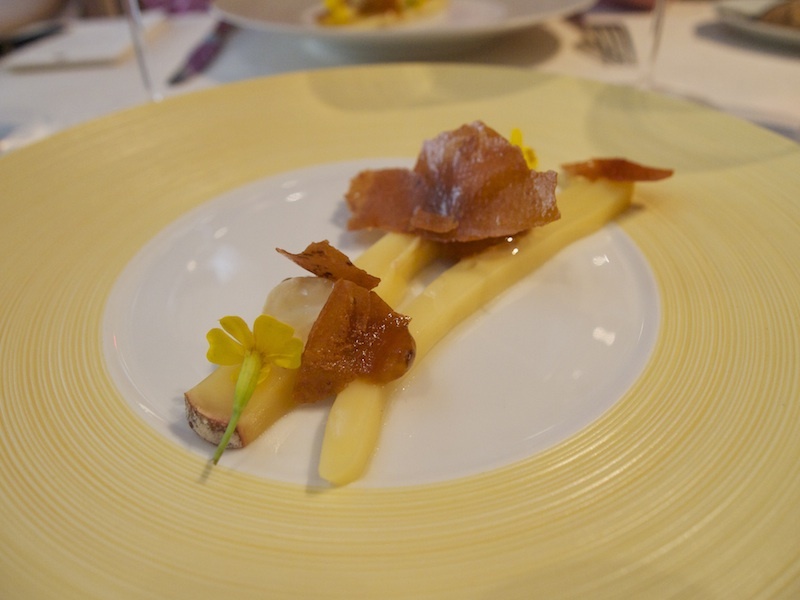 Both the lemon puree and the hazelnut oil enhanced all the other flavours, the former also balancing the richness of the foie gras. 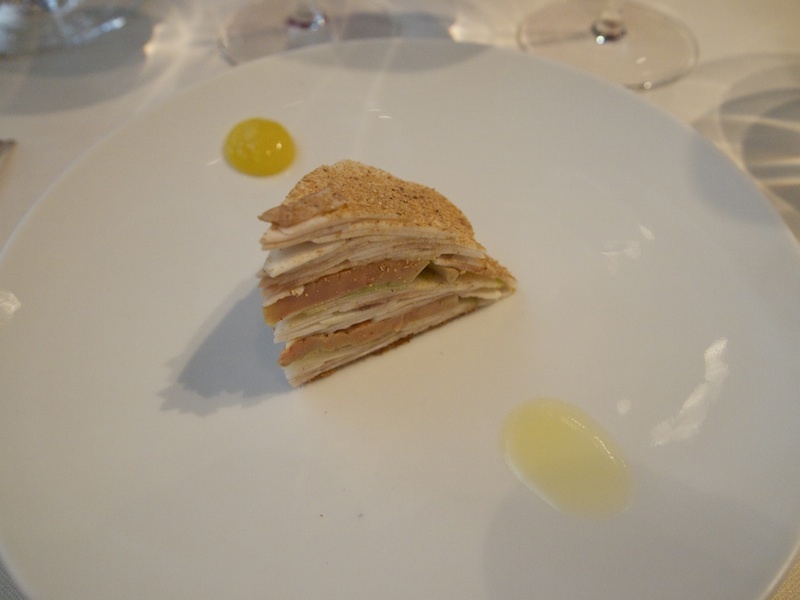 Lovely interplay of textures too, soft foie gras, a little bite from the mushrooms, crunchy apple. Simple, pure, yet so sophisticated. Next, a fat and succulent langoustine (prepared à la plancha) served on top of an elegant Balinese satay paste. Beautifully flavoured paste, subtle heat, tastes of lemongrass and ginger coming through, and great flavour and crunch from finely chopped roasted peanuts. 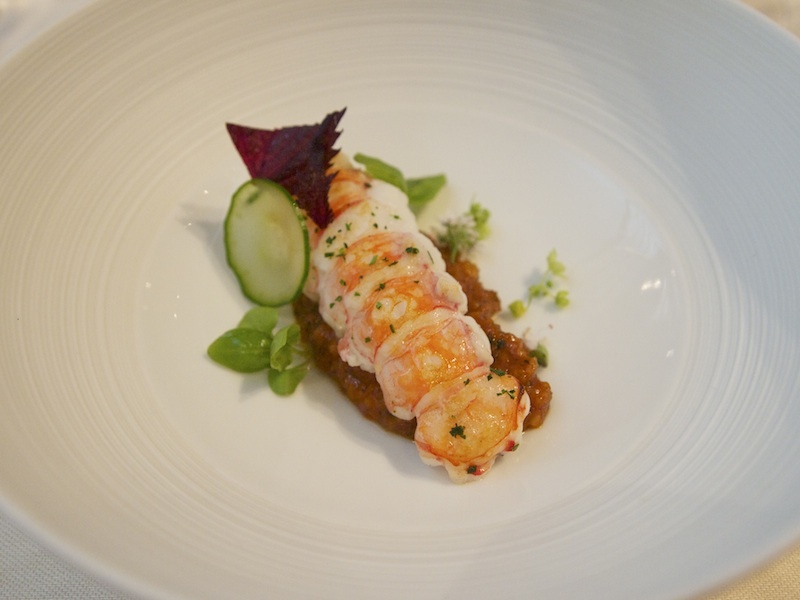 Big, but well-judged flavours that complemented the sweet langoustine superbly. With the langoustine came a perfectly thin and crisp cylinder with a concentrated satay paste, basil, coriander and shiso filling. A stunning combination of flavours, first the warmth of the satay paste, followed by the freshness of the herbs and finally a wonderful, sweet finish. An impeccable dish; the subtlety and finesse of the flavours was spectacular. 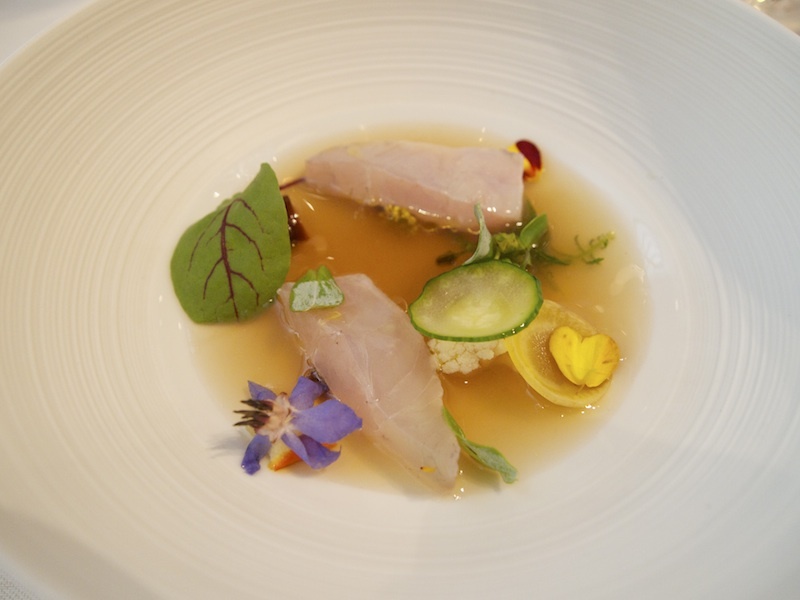 Third course was Seabream, fennel broth, blue marigold, cucumber, yellow carrot, red sorrel and cauliflower. An immaculate fennel broth, delicately seasoned with Suze (a French gentian distillate) and a drop of soy sauce, resulting in an unbelievably intense broth with elegant bitters, a touch of acidity, and terrific aniseed, almost liquorice-like, flavours. The drop of soy really lifted all the flavours. The seabream was wonderfully creamy and married perfectly with the broth. An attractively presented dish with clean and intricate flavours, delicate but powerful at the same time. This was followed by a piece of moist miso-marinated mackerel, sprinkled with toasted buckwheat groats, served with a soft baby leek, confit lemon, lettuce oil and two dots of dark pomegranate molasses. The mackerel had a perfectly caramelised skin. A sublime combination, with a fantastic balance between rich and fresh flavours, the pomegranate adding depth. Equally good was a bowl with a creamy mushroom and smoked anchovy puree, covered with a bright-green rocket and dashi coulis (no photograph). Beautiful clean flavours and the anchovy added a lovely touch of meatiness. Two magnificent dishes that displayed an extraordinary level of skill. Fourth course, pork, but not just any pork. Superb tender belly of pork with meltingly delicious layers of fat, served with juicy girolles, sweet roasted pumpkin, fresh hazelnuts, a crisp sage leave and an incredibly flavoursome pork jus. All the characteristic sweet and fruity flavours of the ingredients were integrated in this dish with great finesse. 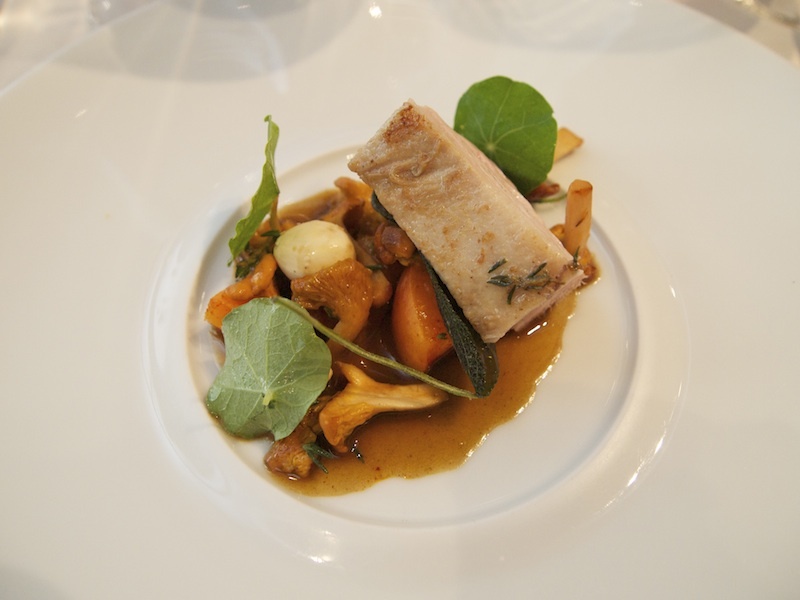 The fruitiness of the girolles matched the sweetness of the pork wonderfully, as did the pumpkin. Distinctive ingredients of this quality don't need a twist, they are wonderful as they are, and Pascal Barbot produced exactly that. Splendid. More meaty wonderfulness followed. Gloriously bleu pigeon breast, served with some delicious soft aubergine, a dark and concentrated pigeon jus, a concentrated cherry paste, deep-fried curry leaves and some fresh thyme/thyme flowers; the tart cherry paste balanced the rich pigeon flavours perfectly and the curry leaves delivered a nice, unconventional flavour kick. 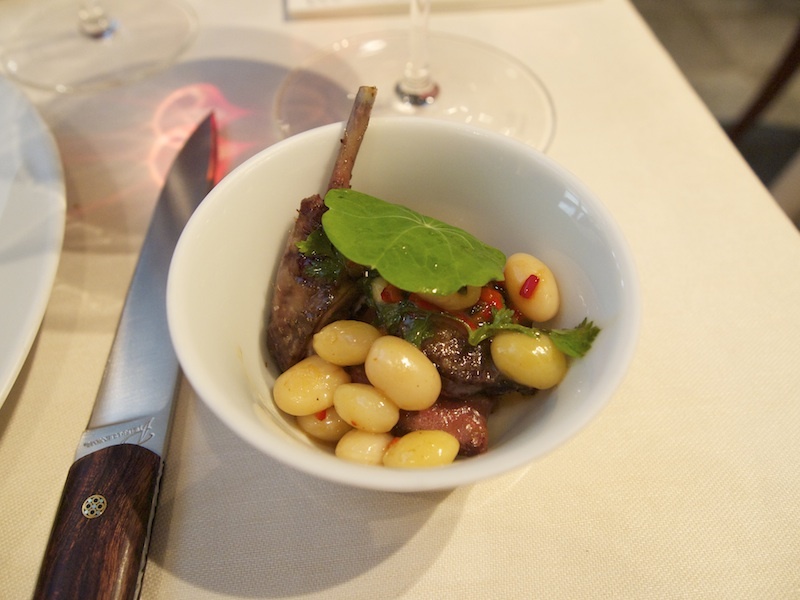 The pigeon leg, coated with finely chopped chillies and the liver (on toast), came in separate bowl, accompanied by some perfectly cooked 'al dente' white beans. The leg was very flavoursome and wonderful warmth from the chillies (rather than heat). Exceptional cooking on all levels. On to the sixth course, two strips of well-matured Saint-Nectaire cheese with fermented plums, elegantly sweet and sticky miso caramel, yellow marigold flowers and fresh hazelnuts. A delicious cheese course with balanced flavours, the yellow marigold had a lovely hint of lemon, that added just right amount of freshness. 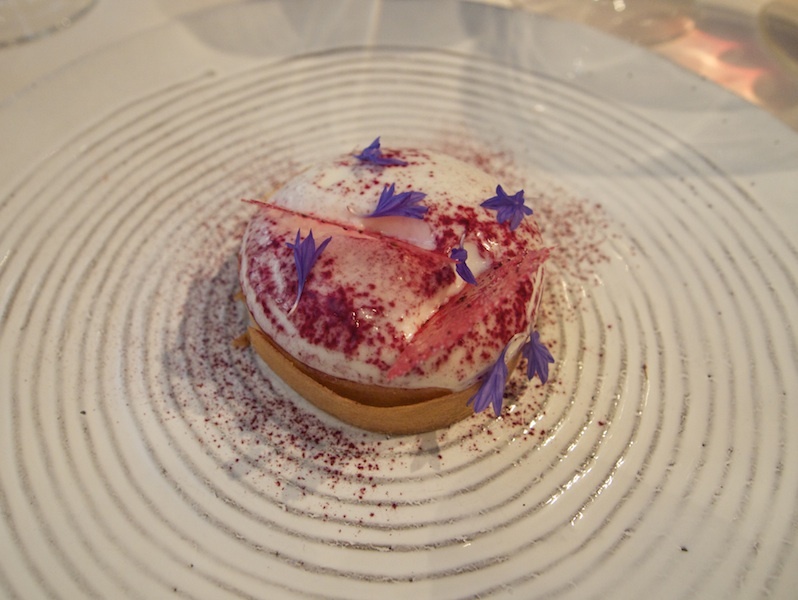 Dessert (seventh course) was a sublime raspberry and blackcurrant tart, topped with a wonderfully floral an aromatic jasmin foam. Alongside came a deliciously tart raspberry sorbet with a fantastic pure and intense rose 'marshmallow' sorbet. Last to arrive were some delicious hazelnut madeleines, lovely fresh fruits, Barbot's signature elegant Jasmin eggnog and an elegantly spicy, chili pepper, lemongrass and ginger Italian meringue, served in a shot glass (no photograph). Pascal Barbot is only in his early forties but he has already garnered a stellar reputation. Together with the likes of Alain Ducasse, Pierre Gagnaire and Alain Passard, he belongs to the small but illustrious group of French chefs who have a truly international profile and are thus the ambassadors of modern French cuisine. Barbot is also a member of the "Cook it Raw" movement and the international it-chef community, rubbing shoulders with colleagues like René Redzepi, Claude Bosi and David Chang. He has already started to produce offspring too; chef Magnus Nilsson of the much-vaunted Fäviken restaurant in Järpen (Sweden) is an alumnus of Astrance. Barbot is a man who is making waves and his cooking convincingly backs it up. He is an extremely creative and imaginative chef; the menu changes all the time, sometimes even from day to day. He takes his dishes on a personal journey during which they constantly evolve, incessantly introducing new techniques and ingredients and always managing to maintain the delicate balance between spontaneity and meticulous research. Astrance produces very aesthetic, high-impact dishes, food that is intellectual but not aloof, perfectly tailored but with deep respect for even the humblest ingredient. 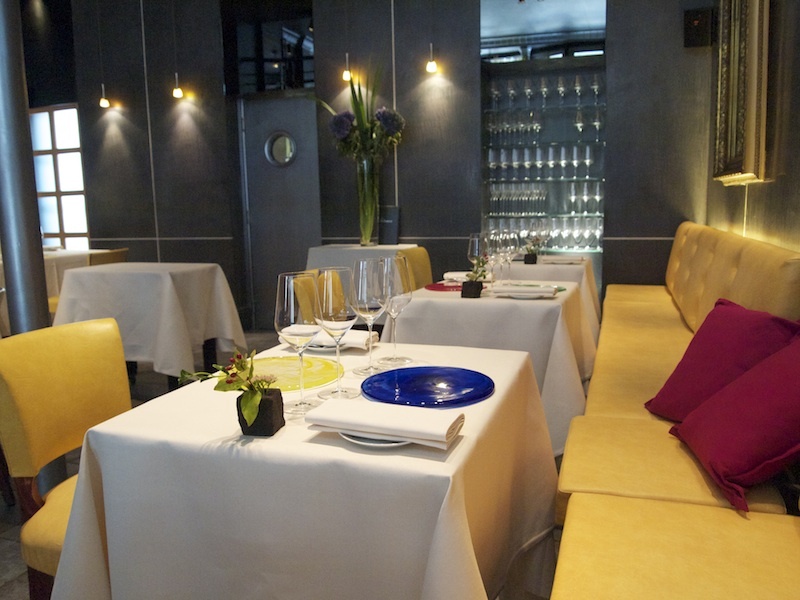 Barbot spent his formative years at l'Arpège and has since then gone on to create his own cuisine and style. 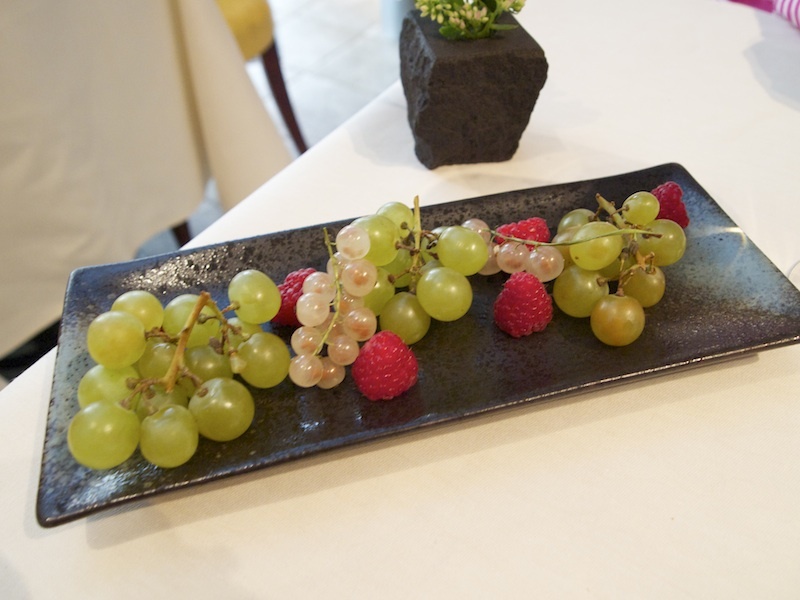 Like no other chef, he masterfully integrates Asian ingredients, flavours and techniques into his contemporary French cuisine. 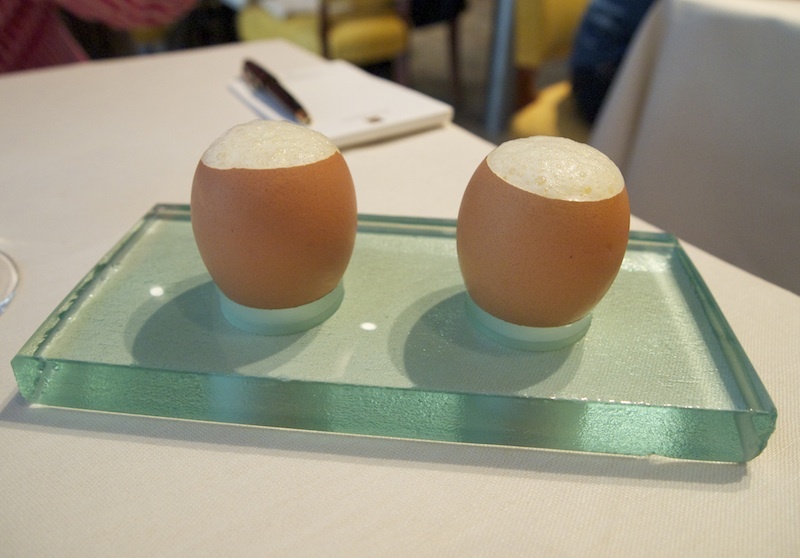 This is state of the art, modern French gastronomy with Asian flair. Fortunately, Pascal Barbot is neither resting on his laurels nor becoming a celebrity chef: as long as he is behind the stoves in the tiny kitchen at Astrance, he will continue to create things of great beauty.